where σ is the conductivity parameter (material specific), J is the current density in a location of that material, and E the electric field in that location. Resistors are passive elements that introduce resistance to the flow of electric current in a circuit. 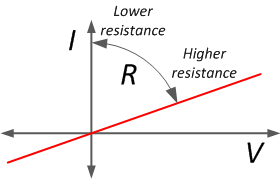 A resistor that functions according to Ohm’s law is called an Ohmic resistor. When current passes through an Ohmic resistor, the voltage drop across the terminals is proportionally to the magnitude of resistance. Ohm’s formula stays also valid for circuits with varying voltage or current, so it can be used for AC circuits as well. For capacitors and inductors the law can of course not be used, since their I-V curve is inherently not linear (not Ohmic). Ohm’s formula is valid for circuits with multiple resistors that can be connected in series, parallel or both. 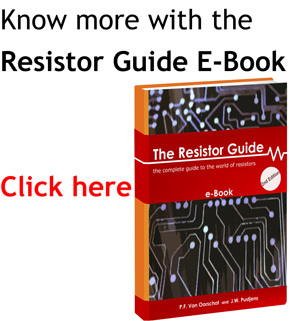 Groups of resistors in series or parallel can be simplified with an equivalent resistance. In the articles Resistors in Series or Resistors in Parallel is described in more detail how to do this. German physicist Georg Simon Ohm published in 1827 his complete theory of electricity with the title “The Galvanic Circuit Investigated Mathematically”. He found that the voltage drop over a part of a circuit is the product of the current through and the resistance of that part. This formed the basis of the law that we use today. The law is one of the fundamental relations for resistors. His colleagues didn’t appreciate his findings, and the law was not easily accepted. Ohm was a teacher at a gymnasium in Cologne at that time, and he decided to resign. Later he became professor of experimental physics at the University of Munich. Later in his life, he finally got recognition and received the Copley Medal in 1841 from the Royal Society. 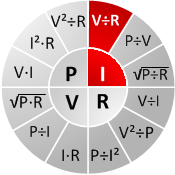 Ohms formula can be used when two of three variables are known. The relation between resistance, current and voltage can be written in different ways. To remember this, the Ohm triangle calculator might be helpful. Two examples below will show the use of the triangle calculator. Thus the voltage at the end terminal is 120-20 = 100 V.
Ideal resistors dissipate all energy and don’t store electric or magnetic energy. Each resistor has a limit of the power that can be dissipated without creating damage. This is called the power rating. Ambient conditions can reduce this value. For example, an enclosure around the resistor or a higher ambient temperature will reduce the amount of energy the resistor can dissipate. This effect is called derating, and can be visualized with a power derating chart. In practice, resistors seldom have an indicated power rating. However, the majority of resistors are rated at 1/4 or 1/8 watt. 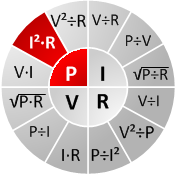 The circle diagram helps to quickly find the relation between electric power, current, voltage and resistance. For each of the four parameters is shown how to calculate their value. 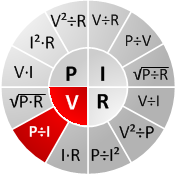 Below several examples of Ohm’s law problems are given. You can try first to solve the problem by yourself before reading the answer. What must be the minimal power rating of this resistor? 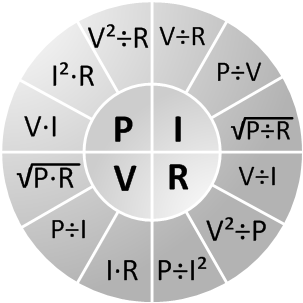 According to the wheel, P=I^2*R= 0.100^2*50=0.5 W. So the minimal power rating should be at least 0.5W, but recommended is to go high above this value for extra reliability and lifetime. What is the current in the circuit? An electric heater (resistor) with a consumption of 1kW is connected in a circuit with 8A current. What is the voltage drop over the heater? The resistance value in ohms is often marked with a color code on the resistor. The combination of colors tells the value as well as the tolerance of the resistor. For more information about this topic, refer to resistor color code.